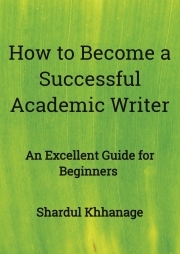 Description of "HOW TO BECOME A SUCCESSFUL ACADEMIC WRITER: AN EXCELLENT GUIDE FOR BEGINNERS "
This book is an excellent guide for new and aspiring writers who want to make a rewarding career in the field of freelance academic writing. The book is developed considering every important aspect of academic writing to make sure fresh talents are imparted with relevant knowledge and information about key areas of academic writing. The book includes details on how to narrate professional research papers, format papers in different styles, referencing styles, recently completed real research papers and special instructions to aspiring writers on what must be implemented in writing professional academic papers. The book is bound to revolutionize the lives of fresh and amateur talents that have a sincere urge to make a career in academic writing field. The author of this book is a highly competent professional working with international clients as senior academic researcher. The author has over 8 years of academic writing experience serving oversea clients based in USA, UK and Australia. The author of the book sincerely intends to offer this book as an invaluable asset to amateur talents who aspire to join the highly rewarding and satisfying domain of freelance academic writing. Reviews of "HOW TO BECOME A SUCCESSFUL ACADEMIC WRITER: AN EXCELLENT GUIDE FOR BEGINNERS "